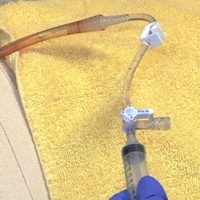 Megan Brashear, CVT, VTS (ECC), demonstrates how to set up a Thora-Seal™ and attach it to a patient to provide continuous thoracic drainage and suction. This is probably a silly question, but would you ever recommend just keeping the patient mildly sedated through entire hospitalization just due to the fact that there's a chance they could pull their chest tubes out or accidentally disconnect the lines? Especially in patients that are usually very active and/or hyper? Or could that cause some issues later? Kristen, not a silly question, sedation is really important for these patients. 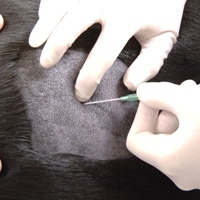 A chest tube is painful to have in place so these guys are often on a CRI of (for example) fentanyl, ketamine, morphine, methadone or a combination of meds to keep them comfortable which will also cause some sedation. We still want them to be able to be up and around but not so much that they are at risk for causing harm. Some especially anxious dogs may need a dexmeditomidine CRI to keep them calm. As the technician it's important to advocate for good pain management/sedation to keep these guys happy! Is it always used with sterile water or can sterile saline be substituted? Emily, here at Dove we always use sterile water but in a pinch you could use sterile saline. The only issue with saline is that it can crystallize and gum up the system.